In this paper result of working quality of Melia dubia was reported after testing them under six major wood working operations namely – planning, sanding, turning, shaping, boring and mortising based on Indian Standard IS 8292. The wood performed extremely well under planning. In shaping, the performance was good enough. Though all the other operations yielded poor results, the composite rating factor which is an overall performance indicator was 35 % more than that of Tectona grandis. The ease of working is only 93 % compared to teak. The working quality index which was based on the composite rating factor and ease of working worked out to 107 taking Tectona grandis as 100 mainly because of the high performance under planning and shaping and good performance under sanding. ASTM D 1666. 1987. Standard methods for conducting machining tests of wood and wood base materials. p237 – 256. BELLEVILLE, B.; ASHLEY, P.; OZARSKA, B. 2016. Wood machining properties of Australian plantation-grown Eucalypts. Maderas-Cienc Tecnol 18 (4): 677-688. BIS IS 8292. 1992. Evaluation of working quality of timber under different wood working operations- Method of test. Bureau of Indian Standards, New Delhi, 7p. BUSTOS, A.C.; MOYA L.C. ; LISPERGUER, M.J.; VIVEROS, M. E. 2010. Effect of knife wear on the gluability of planed surfaces of radiata pine. Wood and Fiber Science 42(2): 185-191. GUPTA, S.; SINGH, C.P. ; KISHAN-KUMAR, V.S. 2016a. Gloss of four common wood coatings measured before and after their exposure to high humidity. Ciência da Madeira (Brazilian Journal of Wood Science) 7 (2): 94-99. GUPTA, S.; SHUKLA, S.; KISHAN-KUMAR, V.S. 2016b. Efficiency of some common coatings in controlling water vapour absorption by wood substrate. Indian Forester 142 (8): 774-780. HAZIR, E.; HÜSEYIN-KOC, K.; HIZIROGLU, S. 2017. Optimization of sanding parameters using response surface methodology. Maderas-Cienc Tecnol 19(4): 407-416. DOI:10.4067/S0718-221X2017005000034. HERNÁNDEZ, R.E. ; BUSTOS, C; FORTIN, Y; BEAULIEU, J. 2001.Wood machining properties of white spruce from plantation forests. Forest Products Journal, 51 (6): 82-88. JAITLY, V.P. ; PANT, B.C. ; GUPTA, S.B. 1983. A note on working and finishing qualities of Eucalyptus species. Indian Forester 109 (12): 917 – 925. KOEHLER, A. 1929. Raised Grain—Its Causes and Prevention. Southern Lumberman, 137: 210 M-210 O.
PANT, B.C. ; SINGH, S.P. ; GUPTA, S.; SHARMA, C.M. 2002. Working qualities of some Indian timbers – Part X. Indian Forester 128 (09): 1021 – 1032. PANT, B.C. ; SHUKLA, K.S. ; BADONI, S.P. 1989. Working qualities of Indian timbers – Part VIII. Indian Forester 115 (09): 644 – 660. PANT, B.C. ; SHUKLA, K.S. ; BADONI, S.P. 1992. Working qualities of Indian timbers – Part IX. Indian Forester 118 (08): 573 – 582. PANT, B.C. ; GUPTA, S.; SINGH, S.P. ; BADONI, S.P. 2003. Working and Finishing qualities of some Andaman timbers. Indian Forester 129 (04): 479 – 488. RELAÑO, R.L., LOBERA, A.S.; VILLASANTE, A.; ESPÍ, P.L.P. ; ROJAS, J.A.M. ; HERMOSILLA, J.A. ; MONTERO, R.S. ; PEÑA, S.V. 2017. 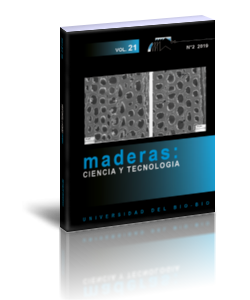 Effect of the anatomical structure, wood properties and machining conditions on surface roughness of wood. Maderas-Cienc Tecnol 19(2):203-212. SARAVANAN, V.; PARTHIBAN, K.T. ; THIRUNERAISELVAN, S.; KUMAR, P.; VENNILA, S.; UMESH-KANNA, S. 2014. Comparative study of Wood Physical and Mechanical properties of Melia dubia with Tectona grandis at different Age Gradation. Research Journal of Recent Sciences 3 (ISC-2013): 256-263. SARAVANAN, V.; PARTHIBAN, K. T.; SEKAR, I.; KUMAR, P.; VENNILA, S. 2013. Radial variations in anatomical properties of Melia dubia cav. at five different ages. Scientific Research and Essays 8 (45): 2208-2217. SARAVANAN, V.; PARTHIBAN, K. T.; KUMAR, P.; MARIMUTHU, P. 2013. Wood Characterization studies on Melia dubia cav. for Pulp and Paper Industry at different Age Gradation. Research Journal of Recent Sciences 2 (ISC-2012): 183-188. SHUKLA, K.S. ; BADONI, S.P. ; PANT, B.C. 1991. Working and carving qualities of Indian timbers. Wood (Oct – Dec): 29 – 34. UDAY, D.N. ; SUJATHA, D.; PANDEY, C.N. 2012. Suitability of Melia dubia (malabar neem wood) for plywood manufacture. Journal of the Indian Academy of Wood Science 8 (2):207- 211. USDA. 1955. Raised, loosened, torn, chipped, and fuzzy grain in lumber. Report No. 2044, Forest Products Laboratory, Madison, Wisconsin, 22 pp. VARANDA, L.D. ; ALVES, M.C.S. ; GONÇALVES, M.T.T. ; SANTIAGO, L.F.F. 2010. Influência das variáveis no lixamento tubular na qualidade das peças de Eucalyptus grandis. Cerne 16:23-32.